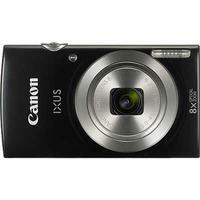 Ultra-compact and stylish, the Canon IXUS 185 HS Digital Camera in black is an easy-to-use, 20-megapixel point and shoot with 8x optical zoom, 16 ZoomPlus, Easy Auto, HD 720p movie recording and bright 2.7 LCD screen. The IXUS 185 is the slimmest in the range and comes with a variety of creative modes, from Fish-Eye, Miniature, Super Vivid and Monochrome. Wrist Strap (WS-800), Battery Pack (NB-11L), Battery Charger (CB-2LFE), AC Cable and User Manual.